From college to marriage to work, Chidambar Rao lived an ordinary existence, until life unfolded in an unimaginable and tragic way that ultimately led him to find peace and inner strength. A metallurgical engineer based in Hyderabad, Chidambar Rao was a seeker since his younger days. He would read books by different Masters even in his college years in search of something else in life. From college to marriage to work, he lived an ordinary existence, until life unfolded in an unimaginable and tragic way that ultimately led him to find peace and inner strength. In 1992, when Rao was 32, he suffered a heart attack, after which he slowly recovered. But his physical problems had just begun. Two years later in 1994, he suffered a major car accident in which he was lucky to come out alive. On the highway, about 80 kms from Hyderabad, a truck came and collided head-on with his car, which also carried his wife and little boy at the time. His wife could not sustain the injuries and passed away on the way to hospital. His son had a temple fracture and a crushed right cheek which needed immediate plastic surgery. 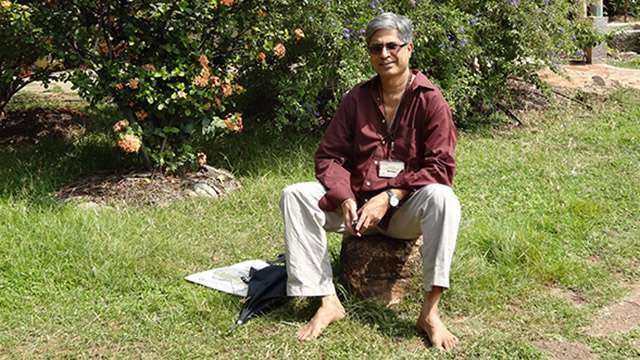 A few years down the line, Rao was in the grip of diabetes and blood pressure. Although he was still capable of working, he decided to quit his job and raise his 11 year old son, as well as look after his mother who was psychologically unwell. Constantly searching for peace in his mauled body, mind and emotions, he tried a few yoga programs in Hyderabad before he happened to sit in the Dhyanalinga at the Isha Yoga Center in 2002. My blood pressure and diabetes are under control...All I can say is without my initiation into Isha Yoga practices, all this would have never been possible. 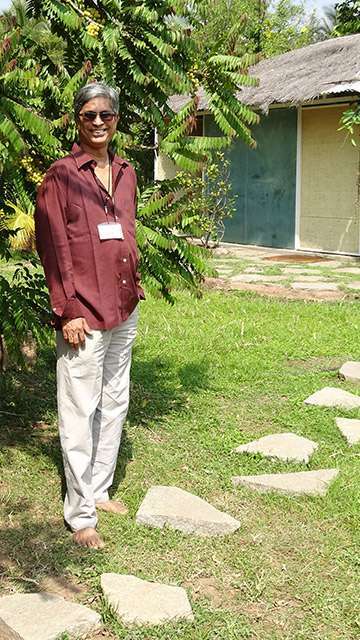 Chidambar Rao is now a full-time resident at the Yoga Center in Coimbatore. His son is doing his master’s in mechanical engineering in Germany, while Rao’s mother has come out of her depression and lives in Hyderabad with his brother. From the hospital to the Himalayas, he has found his way home. It is all because of Sadhguru's grace. Puts life in perspective, that's for sure! Glad to see you made it through! great to read this story. It is all Sadhguru's grace. Chidambar Anna, Very touching. Even more touching because I have known you. Thank you for your inspiration.I share in your gratitude and wordlessness thanks to Sadhguru.May you have many more pilgrammages! Chidamber Rao ji, you are the chosen one.....He chose you, tested you in difficult circumstances......not to lose...you chose your path.....and discovered Him in you to discover what peace means. Peace is perhaps an experience words can never describe.....Trust will be able to meet you and experience His grace. For yours is an experience that is truly rare. wonderful. reading all these is far from what Chidambar Rao has experienced but being able to know all these details is something that anyone would feel inspired about when it comes to taking good care of one's health and body. On the second day of Navratri, Sadhguru explains about tamas – the nature of the first three nights of Navratri.